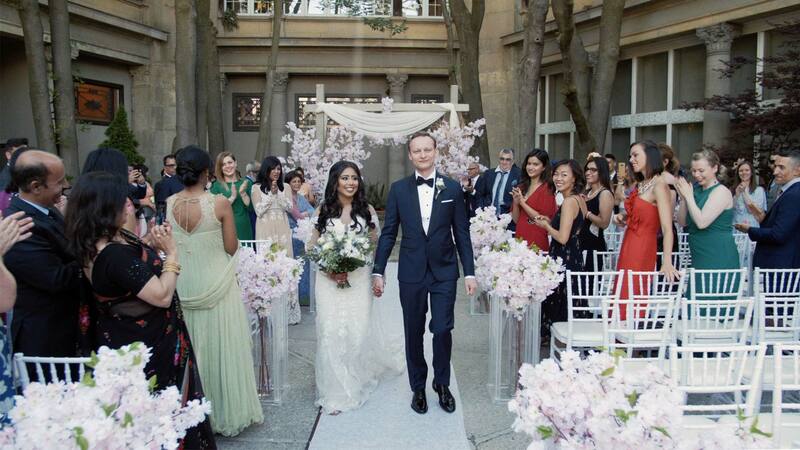 We’ve already written quite a bit about Mike and Nabeela’s Liberty Grand Wedding HERE. As much fun as we have putting together Same Day Edits there really is no substitute for a well-put together Cinematic Film. We get to show so much more and reflect the dynamic nature of the day. This is why we always recommend Same Day Edits as an addition, rather than the main focus of a wedding film collection. They’re a compliment to the entertainment of the day. But a really good Wedding Film, with time and thought put into it, is a true keepsake that you’ll treasure for the rest of your lives. Although we filmed interviews as part of the Same Day Edit, we still wanted them to form a significant part of the main film. The way they talk about the early stages of their relationship sets the tone for their “togetherness”. When we’re able to get nice candid interviews it really helps to lift the lid on the story of the couple. You’re not listening to pre-written letters or vows, you’re hearing real responses to a discussion about their relationship. We also got some great audio from the rest of the day. Nabeela’s grandfather’s speech, Mike’s sisters’ reading in the ceremony and of course the letters and vows that they wrote to each other. All that audio comes together to form the narrative of the film and guide us through he experience of either reliving or watching for the first time. The more that we’re given the further we can go with the story. We always tell couples that our aim is to create something that reflects the true nature of who you are. So a stranger could watch your wedding video and get a sense of what you’re all about. We really like how this film has a very distinct and balanced three-act structure. Three pieces of music that compliment each chapter of the film as we set the scene, get married and celebrate. One of the benefits of filming pre-wedding events is that it gives us more opportunity to establish the characters of the story. When you think about a wedding, it is never just one day. There’s the build up, preparation and anticipation. So it’s great when we can have a little more time before hand to capture that. It helps the rest of the story flow, because we’re not introducing characters when we should already know them. I really like seeing a couple in a wedding film when they’re not at the wedding. For me, it makes the reveal of their wedding outfits more impactful. From that moment on you can’t help but share the journey with them. The vows become more meaningful, because you already got to know them and you feel a greater sense of joy when you see them having the time of their lives. Speaking of which, we always love that last act. Its the part where you feel like “that was a great wedding”. When everyone lets lose and just has a great time. Its pure positive emotion and we love to show that off.